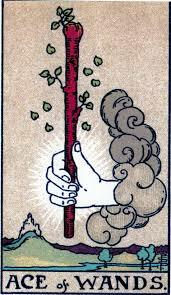 The Ace of Wands is a symbol of possibility in the area of creativity, excitement, adventure, courage and personal power. It might be a creative idea, surge of optimism or need to act boldly. On the outside, it could be an offer, gift, opportunity, encounter or synchronistic event. If your card is the Ace of Wands be daring and brave. Sometimes you have to risk to get what you want. Look for the path that will excite you and push you beyond your limits. This Ace tells you that a time of passion is beginning. You will be able to assert your best for all to see. Forget tired, worn-out solutions. You have the chance to be original. Trust your own creative potential, and there will be no end to what you can achieve. The Ace of Wands card depicts being upbeat – optimistic – and hopeful about your future – with good cause! You are likely to be feeling quite energetic and positive – or you very soon will be feeling that way. When the Ace of wands appears, know that something new and very positive is likely to be headed your way soon. Be bold and ask for what you want/need in the work/career arena. You are likely to be more successful than you’d dream possible. Make yourself available for love in whatever way makes sense to you. If you are already committed, the ace tells you that the relationship is about to undergo a ‘new beginning,’ and you will rise to new levels of understanding each other. Express yourself. Creative force – Enthusiasm – Confidence – Out of the box thinker – Having high self-esteem – Being upbeat optimistic!